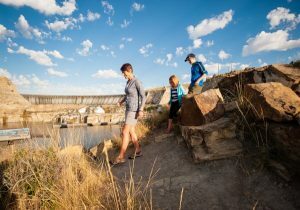 It’s always a great time to go off the beaten path and as Montana’s basecamp for Art & Adventure, Great Falls provides several opportunities for families to make memories and experience the best of Montana for free! 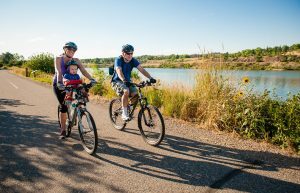 One of my favorite – and free – activities in Great Falls is the River’s Edge Trail, a 60+ mile (100km) trail system that winds through the city along the Missouri River, and enjoy a bike ride with my family. Our son, who is 2.5, loves riding along and taking in the scenery while we do the hard work! He marvels at the ducks, geese, birds, and art we see along the trail. One point of interest is the Gazebo at Overlook Park. 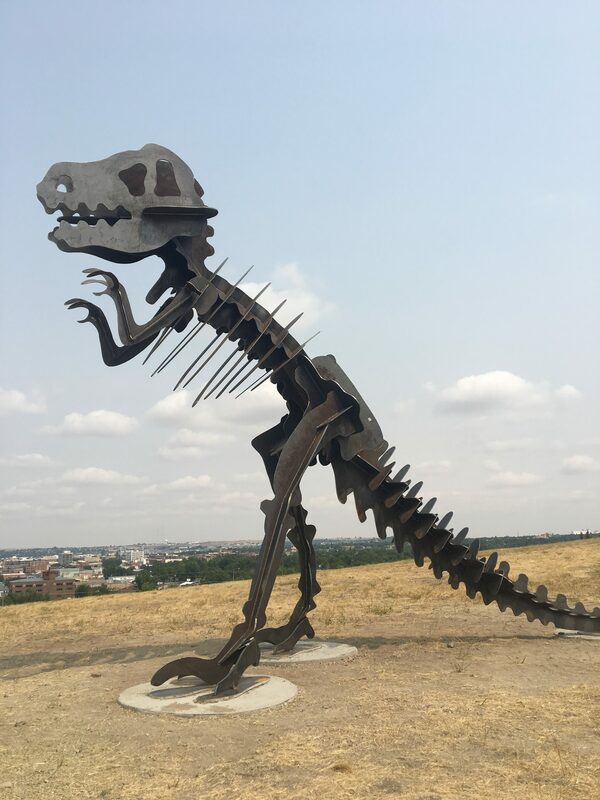 Telescopes provide a panoramic view of the city and just below is the newest addition to the trail’s art collection, a 15-foot T-Rex sculpture made by Anderson Steel. Our son loves roaring at this realistic replica! While on the trail, we enjoy the adventure of Montana’s best urban trail system while sharing an afternoon of fun together. The River’s Edge Trail has several access points, allowing you to enjoy as much of the trail as you want. Some of the best places to access the trail is the Caboose east of 15th Street. From there, you can walk to Giant Springs State Park and along the way, enjoy the view of Black Eagle Falls. The 3.5 mile Urban Adventure loop allows you to experience downtown Great Falls along the north and south side of the River while crossing 2 pedestrian-safe bridges! Not long ago, the buffalo roamed the plains, and they numbered in the hundreds of thousands. Their importance to the Plains Indians made them Monarchs of the Plain. In the early 20th Century, as their numbers began to dwindle, conservation efforts began to preserve this majestic animal from extinction. The Buffalo Hunt project is a celebration of the Buffalo and the culture, history, and art of the area they once roamed. Today, you can find 26 life-size fiberglass buffalo and calves that were created and sponsored, with artists painting their buffalo in a style that reflect both their personal style, and the theme of the setting. Upon completion, the herd was unveiled in May 2005. Today, these buffalo reside around Great Falls, and a great way to see all the buffalo is by participating in the Buffalo hunt, a free Art & Adventure celebration the entire family will love. The Buffalo hunt takes you around Great Falls, so take in the sights of the city while you enjoy one of the best scavenger hunts in Montana! 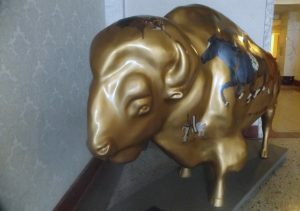 Everyone has a favorite buffalo; mine is the Rainbuffalo by artist Chris Miller. Rainbuffalo “symbolizes my long-term love of the water and a respect for the freedom that wild animals enjoy.” Rainbuffalo is along the River’s Edge Trail, across from Milwaukee Station at 1 River Drive North. As you hunt for your favorite, share what you find using #GreatBuffaloHunt. Great Falls has 57 Parks, and last year, Great Falls Tribune digital editor Matt Ochsner began a project to take his daughter to one park each week. The results are documented in a heart-warming article. Matt’s project demonstrates that Great Falls has more than enough parks to enjoy – for free – with your family. 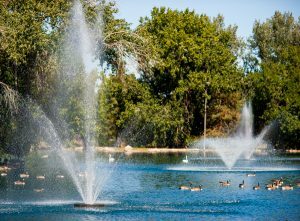 The gem of the Great Falls park system is Gibson Park, where you can feed the ducks, walk along the River’s Edge Trail, experience one of the best skate parks in the Northwest, and more! Every Wednesday in the summer, enjoy a free concert from the Great Falls Municipal band as they play classical music, movie scores, and everything in between. At Oddfellows Park, a giant turtle, a sea serpent, and playground equipment make this a place of adventure. You can access fishing, canoeing, paddle boarding, and kayaking. Just north of Oddfellows park is Broadwater Bay with a boat launch so you can get on the water and enjoy the scenery of Great Falls. Lions Park boasts an F-106 plane, courtesy of Montana Air National Guard. Lions Park has a sprawling complex of picnic tables, covered shelters, tennis courts, a rock wall, and play equipment along a walking path. Lions Park is full of art and adventure your family will enjoy! Plan on visiting any one of Great Falls’ 57 beautiful parks for an afternoon of fun you won’t find anywhere else! Paris Gibson Square is one of Great Falls’ oldest buildings, and is the home of some of the most thought-provoking modern art in the state! In addition to art, the square hosts receptions for new artists, lectures, and artist demonstrations. The stately sandstone structure that serves as the Paris Gibson Square Museum of Art is a nationally registered historic site named for the founder of the city of Great Falls, and when my son and I take our dog for a walk, he points to the building as says ‘castle!’ Paris Gibson Square could easily be mistaken for a castle; established in 1896 as a high school, the building was refurbished in 1977 and now is a vibrant community center. One feature of Paris Gibson Square is the growing outdoor sculpture garden; the oversize yellow lawn darts are hard to miss! 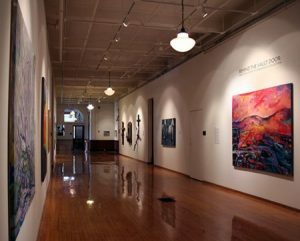 The museum has grown from its humble beginnings to become a significant artistic and cultural resource in Montana. Paris Gibson Square celebrates local history, culture, and modern art. Ever-changing displays explore contemporary issues, spark humor, and inspire contemplation. The exhibits have an astonishing variety of media, such as Lee Steen’s wooden stick figure sculptures that once graced Montana roadsides and Jean Price’s exhibit, 3,000 and Counting that commemorates the sacrifices made by US troops in Iraq who have lost their life in the war, represented by an aluminum foil dog tag that includes name, rank and age. Admission is free thanks to Farmer’s Union Insurance. Giant Springs State Park is Montana’s most-visited state park and home to one of the largest freshwater springs in the country. The springs flow at a rate of 156 million gallons of water per day and the water stays at a temperature of 54 degrees. Accessible from The River’s Edge Trail, the park boasts views of Black Eagle Falls, a variety of bird life, and fishing ponds; if you have a current Montana fishing license, you can cast your line for free! Giant Springs is the only state park in Montana with a fish hatchery, making this a great place for children to learn about the life cycle of native Montana trout. A pond outside allows children to feed the fish! Walk through the display to learn about how the fish are raised and released into the Missouri, then walk around the grounds to view the fish in their natural habitat. 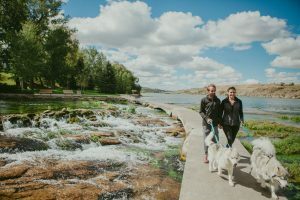 As you’re planning your visit to Giant Springs, pack a picnic to enjoy along the banks of the Missouri River and when you’re done, walk along the trail that winds around the World’s shortest River. At just 201 feet long, the Roe has the unique distinction of being the world’s shortest River. The crystal-clear water provides a view of the natural plant life that thrives in the water. Finally, walk or bike the 2.1 mile Giant Springs Loop along the River’s Edge Trail that provides a breath-taking view of the city the whole family will love! What better way to experience the unique and adventurous side of Montana than by visiting the 5 Falls of the Missouri, including the Great Falls. As the only city in Montana with 5 falls, you can see, visit, and experience the first major falls the Corps of Discovery encountered. The best view of The Great Falls is done from the highest peak at Ryan Island Park, which is accessed from a suspension bridge across the Missouri River. The roar of the falls is best witnessed in the Spring, just like Captain Lewis experienced. The canyon walls show the arduous task of portaging around the Falls that laid ahead of the Expedition. The Great Falls stand 148 feet [45 meters] due to the dam. Enjoy a picnic, a short hike around the grounds, and access River’s Edge Trail if you want more adventure! A quick drive from Ryan Dam will take you to the Morony Town Site that provides a glimpse into where present-day Great Falls almost was. Explore the grounds that include an abandoned homestead. Great Falls Montana offers an array of adventure, art, and excitement for families. When you need an escape from the ordinary, when you need to give your wallet a break, or when you want to enjoy some of Montana’s best art and adventure, Great Falls is the place to be!